Amnesty has published information regarding last year's use of the death penalty. Good news in Europe as it was the first year that there were no recorded executions but not good news elsewhere. The worst suspected offender was China where Amnesty were unable to have access to the figures but reports have indicated it was in the thousands. The USA executed 52 people last year, unsurprisingly the majority of whom were in Texas. Here is the report. Alistair Darling, George Osborne and Vince Cable will be going head to head on a live debate on Channel 4 tonight at 8pm. You can check out more information on their site here and see further comment here. Let us know how you think they performed, and please vote on our new poll! The British Library has been busy digitising its material and putting on the web. 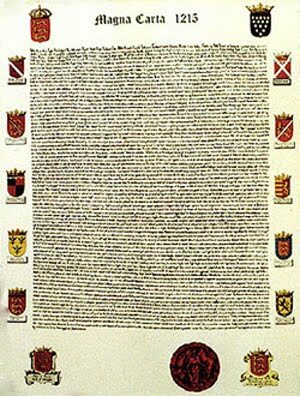 These include the Magna Carta, Chaucer's Canterbury Tales, Shakespeare's plays and the Gutenberg Bible. They include instant translations and guides by the curators. There is also an impressive timeline showing other important works in their collection. If you spot any other interesting documents like these, please let us know. 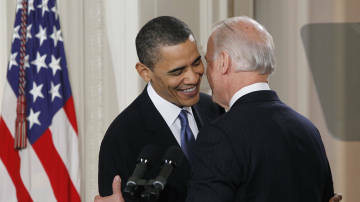 The signing of the Healthcare Bill into law on Tuesday is a big deal as Joe Biden said a little less politely. See here for Mark Mardell from the BBC's analysis. 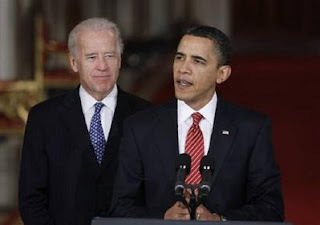 What do you think - will this improve or end Obama's chances in the November mid-term elections? What do you think of the healthcare provisions themselves? 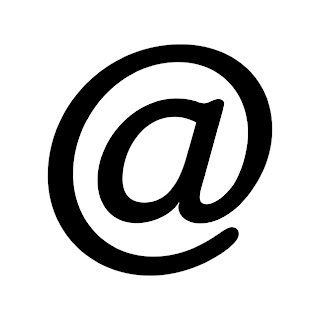 Here is a short article about the history of "@", which has been officially honoured today by New York's Museum of Modern Art. Apparently it dates back to the 6th Century and was used as a symbol of measurement, as shown in the image below. It took on its digital meaning in 1971 and hasn't looked back since. This week and next week you will get a chance to choose the candidate you think will best represent the party that you support at our mock election - which will be on the same day as the real general election. The following people will be standing as candidates. You need to go and hear their reasons for why they would be the best candidate and vote for them. For the Conservatives, speeches and vote to take place on Wednesday 24th March in Room 103. For the Liberal Democrats, Thursday 25th March in Room 105. For the Labour Party, Monday 29th March in Room 106. Nonsuch's Green Party candidate is unopposed. 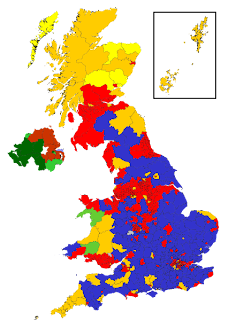 You can find out more information about the timing of the UK general election here and compare the parties here. Is this the end of the healthcare saga? 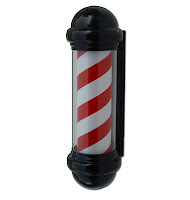 It looks like it. A 219-212 vote in last night's House followed by a likely 51 vote majority in the Senate and a certain signing by the President means that after over a year of wrangling the USA has finally enacted extended healthcare insurance for its citizens - approximately 32 million people. However, that is not the end of the story entirely as there will be court challenges and the Republicans will want to keep the issue in the public eye until the mid-term elections this November. See here for Mark Mardell from the BBC's comments and here for the story from Channel 4. Channel 4 is putting lots of its archive material onto YouTube. This includes plenty of history programmes such as this one which has Tony Robinson investigating the claims that Edward IV might have been illegitimate. He then goes out to find who Britain's "real" monarch might have been if the claims had been upheld, and even produces an alternative royal family tree. The results are quite surprising...and the picture above is of the current "King Michael"! Here's a link to the other documentaries available from Channel 4 on YouTube. If you spot any worthy of Nonsuch HP readers, please let us know. 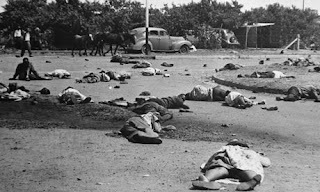 Sunday marks the 50th anniversary of the Sharpeville Massacre. On 21 March 1960 police opened fire on unarmed protestors in the South African township of Sharpeville, 30 miles from Johannesburg. 69 people were killed and the atrocity became a symbol of the struggle against apartheid, forcing the world to confront the injustices taking place in the country just as the Civil Rights movement began to gather momentum in America. Nelson Mandela recognised the significance of this event by arranging for South Africa's new post-arpartheid constitution to be signed in Sharpeville in 1996. More information here and an there is an audio slideshow here. The original report from the Guardian is here. Russia: A Great Leap Forward? There is a fascinating article in this week's Economist (Nonsuch HP hopes the subscribers are enjoying their copies!) about the Russian government's plans to develop its economy and encourage high-tech industry. Those who have studied Russia's history over the last 100 years or so will notice some interesting links to previous plans to develop the economy, going right back to Alexander II via Stalin's 5 year plans, some of which are alluded to in the article. Today also marks the 25th Anniversary of the first ever "dotcom" domain name being registered. 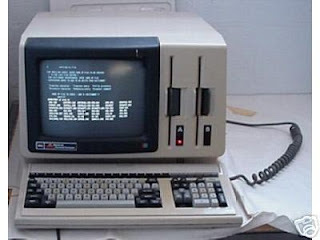 It was "Symbolics.com" and it still exists. You can find out more about this here and a list of the first 100 sites here. PS: It's Science Week this week at Nonsuch and the theme this year is "The History of Science", marking the 350th anniversary of the Royal Society. There is a super timeline of significant scientific milestones here and the more about the Royal Society here. Watch out for events across the school! Here is a fascinating BBC article about how Wembley Way, the road leading to Wembley stadium, was constructed in 1948 using labour from German prisoners of war, three years after World War 2 had ended. 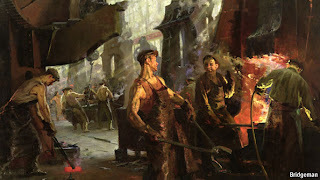 The acute labour shortage in Britain and the need to finish the project in time for the Olympics led to their use, even though Germany was not allowed to compete in the Olympics themselves. 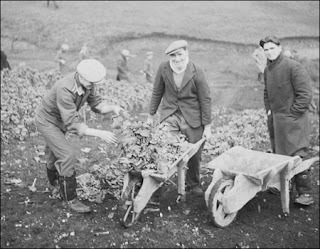 In 1946, there were still 400,000 prisoners in the country, most of them working on the land (including vegetable growing as shown in the picture above) as many British men were still committed to military duties. The last were sent home in 1948 but 15,000 chose to remain in Britain. 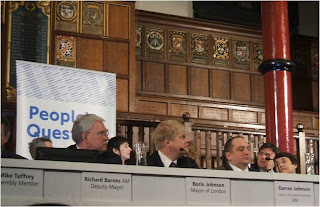 On Wednesday 3rd of March four Nonsuch politicians sat in the illustrious surroundings of Harrow’s Speech Room eagerly awaiting the arrival of our London Mayor Boris Johnson. For the next two hours Boris and the London Assembly (minus its BNP member) ‘answered’ the questions posed by audience members gathered from the surrounding areas of Brent and Harrow. Boris was easily the most accomplished politician on the stage and was generally popular, his Etonian wit saved him from several sticky situations and we suspect proved useful in preparation for his appearance on the more high profile BBC Question Time broadcast the following evening. For more information please follow this link to the London Assembly Website which includes a full webcast of the event. Many thanks to Nonsuch's CM and CF for that report! 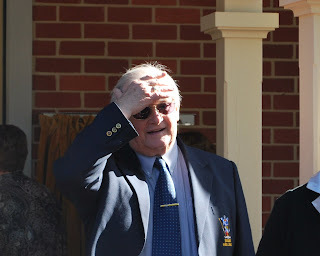 All contributions to the blog are very welcome - if you have anything political or historical you would like to share, please get in touch with Mr Coy or Mrs Budden. 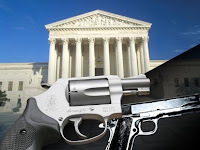 A related article here from the Economist this week highlights a Supreme Court case that will be illustrative of the Court's view of the Second Amendment but a difficult one for conservatives - guns or states' rights? Northern Ireland's decision to allow the devolution of policing and justice powers is an important development in the history of events there since the Good Friday Agreement in 1998. The party politics is also interesting, with the DUP having been key to the decision and the UUP disagreeing. David Cameron's decision to make an alliance with the UUP in this context looks interesting. Another feature that was noticeable with the Good Friday Agreement was the involvement of the Americans, in Tuesday's case Hillary Clinton and George W Bush were involved but to seemingly less effect. See the BBC story and links here and the Guardian's here. 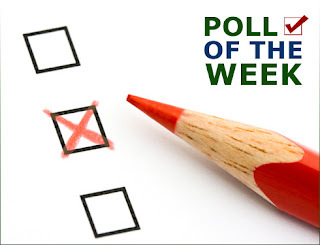 What should our next poll be? If you have any good ideas, please post a comment, and we'll put the best ones into action. The parliamentary candidates for Sutton came together for a hustings event at Sutton Grammar School on Monday night, and several Nonsuch girls went along to observe proceedings. You can read a full report on the Politics Etc blog (Many thanks to Mr Marshall for this) and also read the views of Charlie Edwards, the student who organised the event here. PS: There will be a similar event at Carshalton Boys College on 15 March where Tom Brake MP will take part with his fellow candidates. PPS: There will be a small prize for the first person to work out where the flag in the image above is from. 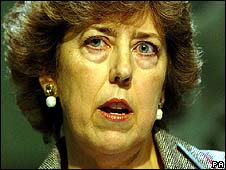 A fascinating talk last night at the House of Lords by Eliza Manningham-Buller, the ex-Head of MI5, where she admitted that the Americans had been less than forthcoming about their mistreatment of detainees to the British secret service. 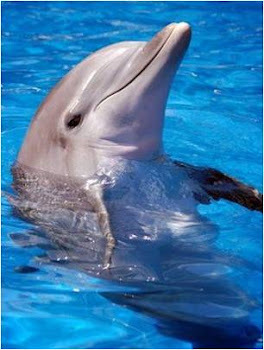 Here is the BBC report on the issue and here is the report on it by the Huffington Post in the US. She made it very clear that the British view was that torture was completely unacceptable and that to use torture was to become like the enemy you were trying to fight. Today is International Women's Day. It was first held in 1911 in Austria, Denmark, Germany and Switzerland, when over a million women attended rallies demanding equality. Ukraine, China and Vietnam mark it with a holiday. Here are some further facts and here is the official website. But is such a day really needed any more? 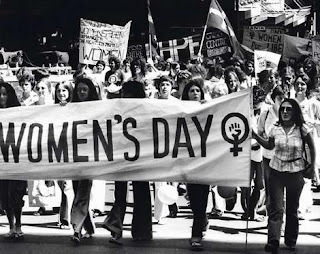 What events from "women's history" are worth celebrating today? A series of reforms have been voted through the House of Commons that may help to address the problem of an over-mighty executive. These include: the election of the chairs of select committees by secret ballot, the appointment of an opposition party member to the important Public Accounts Committee and a new backbench committee which will set a timetable for Commons business. Here is the BBC report of the changes and here is the Commons Reform Committee's website. Michael Foot, a controversial figure while leader, has been praised highly when his death was announced yesterday. He is probably known best for his defeat in the 1983 election on a manifesto which was called 'the longest suicide note in history'! His replacement by Neil Kinnock started the reform of the Labour Party and what we know today as New Labour. Have a look at the obituaries, here on the BBC and here on Channel 4. 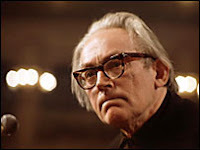 As you can imagine, there are plenty of interesting comments and reminiscences about Michael Foot in the Guardian, which you can link to here. This post will collect up the results from the various polls so they don't clutter up the blog too much. 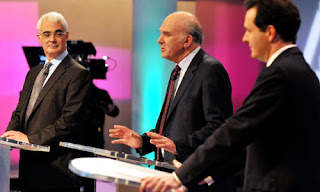 Are you excited about the TV Debates? Should the Monarchy have been restored in 1660? What did you think of Nick Barratt's talk? Plans have been revealed for the 3 debates that will take place between the party leaders before the election on presumably May 6. It's a historic moment but will the strict rules stifle the debates too much? 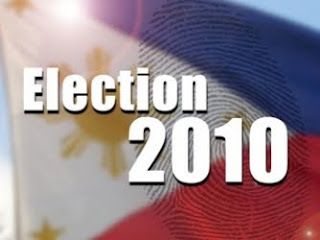 What effect do you think these debates will have on the election and do you think they will be worthwhile? Meanwhile, BBC3 is showing a "First Time Voters Question Time" on Wednesday evening, presented by Dermot O'Leary. Here is there Facebook Page and a list of the panellists. If you watch it, let us know what you think! PS: Here is some inside info on how the Prime Ministerial Debates' rules were agreed. PPS: Our colleague at Politcs Etc has some interesting comments to make about the current state of the BBC. Recommended reading! PPPS: Here's a not particularly positive review of the Dermot O'Leary programme. Did anyone else see it? Do you particularly want "youth" politcs programmes or are they all "epic fails"? 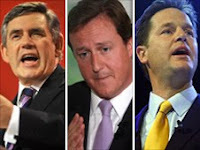 There is now a new section of links on the blog marked "Political Action", noting campaigns and pressure groups that are trying to encourage political or social change for the better. 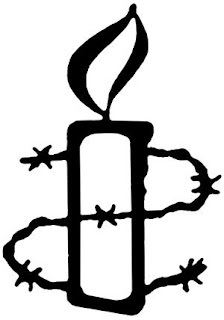 There is a link to Amnesty International, particularly because of the excellent work the Amnesty Society has done within school to raise awareness of human rights issues. There is also a link to Stop the Traffik, a coalition of international groups working together to raise awareness of human trafficking and exploitation. Both of these organisations are certainly worthy of your attention - are there any other groups that you would like to see us linking to? PS: Have a good RAG Week!